My real-estate firm found a tunnel from Mexico to California. Apiece of precision equipment about the size of a tractor could defeat a key mission of any new wall along the southern U.S. border, even before the foundation is poured. Horizontal directional drilling—known in oil-and-gas parlance as “HDD”—made the fracking revolution possible. But an unexpected early adopter near this California border town is a drug cartel. The kingpin Joaquin “El Chapo” Guzman Loera is being held in a hardened Manhattan jail cell, but nobody does cross-border digging better than his Sinaloa Cartel. The drug lord escaped from prison in 2015 after a crew tunneled to retrieve him. Soon all-but-undetectable boreholes may whisk cylindrical containers across the border from Mexico, wall or no Wall. Last year, while doing work linked to the modernization of the Calexico border crossing, my firm’s research department, sifting through property records and interviewing buyers and sellers, stumbled onto what’s believed to be the first real-estate purchased in the U.S. expressly to mask the exit of a drug tunnel. The site had already been raided and its owner arrested. A house had been built around a hole leading to a 32-foot vertical shaft and then the main tunnel. It was an engineering marvel, with rails and lighting, running 415 yards across the border to the back of a restaurant in Mexicali. 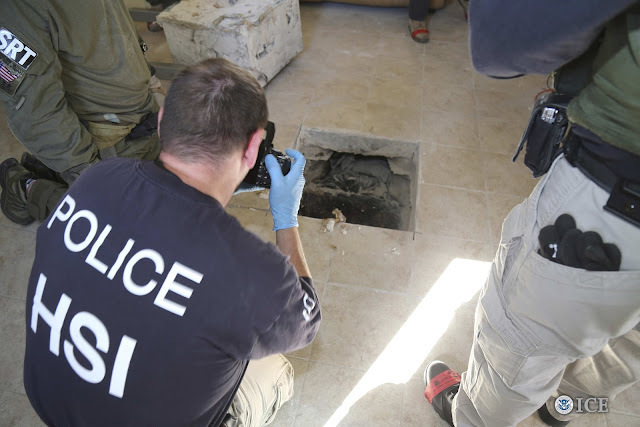 The feds have discovered more than 80 cross-border smuggling tunnels since 2006. Most have been man-sized, but those may soon be obsolete. A used directional-drilling rig—say, the Vermeer Navigator D10x15 or the Ditch Witch JT25—can be bought online starting at about $100,000. The low cost could “democratize” drug tunneling and render obsolete the antidrug mission of a Trump-esque wall. The technology requires almost no manual labor. A rig can drill a tube, from 8 to 80 inches in diameter, for a mile horizontally, “geo-steered” to hit a precise target. The driller can monitor his progress in real time while the system automatically lays pipe behind the drill head. In Calexico, seven trafficking operations involving HDD rigs have been discovered since 2008, sometimes when the drill bits hit city infrastructure, as Jason Kersten reported for GQ in 2014. He explains that in 2011 the Calexico Fire Department responded to a report of a foul odor from a motorcycle shop. A hazmat team broke inside and found a Ditch Witch JT8020—one of the so-called maxi-rigs. Smugglers had planned on drilling underneath a canal to reach Mexico. The reality is that there may not be a ready solution to fight these illicit subterranean activities. But one thing that clearly won’t work is a big, beautiful wall. Mr. Bagott is a real-estate appraiser for Bender Rosenthal in Los Angeles.